A research group from Kumamoto University, Japan has discovered a new neurogenic mechanism responsible for brain development. By applying proprietary technology to detect trace proteins in living organisms, they found that a novel protein, called Matrin-3, is responsible for determining the fate of neural stem cells. A deficiency of this protein causes a disordered differentiation of neural stem cells into neurons, which results in the collapse of the brain layer structure. It is clear that Matrin-3 is important for the maintenance of neural stem cells in brain development. The Kumamoto University research group attempted to find a molecule that controls the fate of neural stem cells. In particular, they wanted to find a transcription factor that regulates genes with extremely small expression. Transcription factors regulate signals, by turning them on or off, using phosphorylation–a mechanism that changes the action of a protein through the addition of a phosphate molecule. However, since phosphorylation occurs inside an organism (in vivo), and only in trace amounts inside a cell nucleus, it is difficult to capture the phenomenon. Fortunately, the research group had previously developed their own technology to detect these trace amounts of proteins. Using this proprietary technology, the researchers discovered a novel nuclear phosphorylation protein called "Matrin-3", which they ascertained was responsible for determining fate of neural stem cells. When undifferentiated neural stem cells, which were harvested and cultured from a fetal mouse brain, were given fibroblast growth factor (FGF2), expression of Matrin-3 increased greatly and phosphorylation advanced. 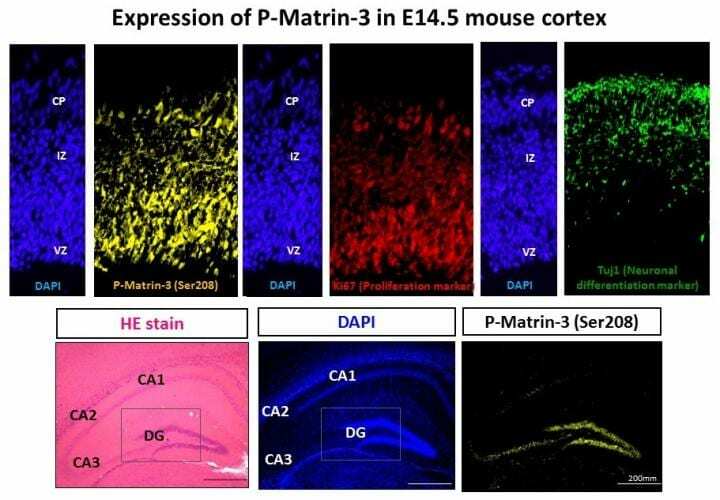 In addition, Matrin-3 was highly expressed and phosphorylated in regions of the fetal mouse brain where there is an abundance of neural stem cells. On the other hand, in vitro experiments revealed that a deficiency in Matrin-3 causes neural stem cells to elongate and differentiate into neurons. And, in in vivo experiments, a section of the embryonic brain layer structure (one peculiar to the cerebral cortex) collapsed upon itself. Furthermore, as a result of an experiment to elucidate the phosphorylation function of Matrin-3 in detail, researchers found that a specific site (serine residue at position 208) in the amino acid sequence of Matrin-3 must be phosphorylated by a specific enzyme (ATM kinase) to maintain undifferentiated neural stem cells. "Recent studies have revealed that a Matrin-3 gene mutation causes familial amyotrophic lateral sclerosis (familial ALS)," said Assistant Professor Kanako Niimori-Kita, who led the study. "It is thought that genetic mutation of Matrin-3 causes dysfunction of factors regulating neuronal differentiation and disrupts on/off signal transduction, which then impairs normal signal transduction and brain development. The results of our research may provide important clues to elucidate the mechanisms of familial ALS." This research was posted online in Scientific Reports on the 7th of September 2018.